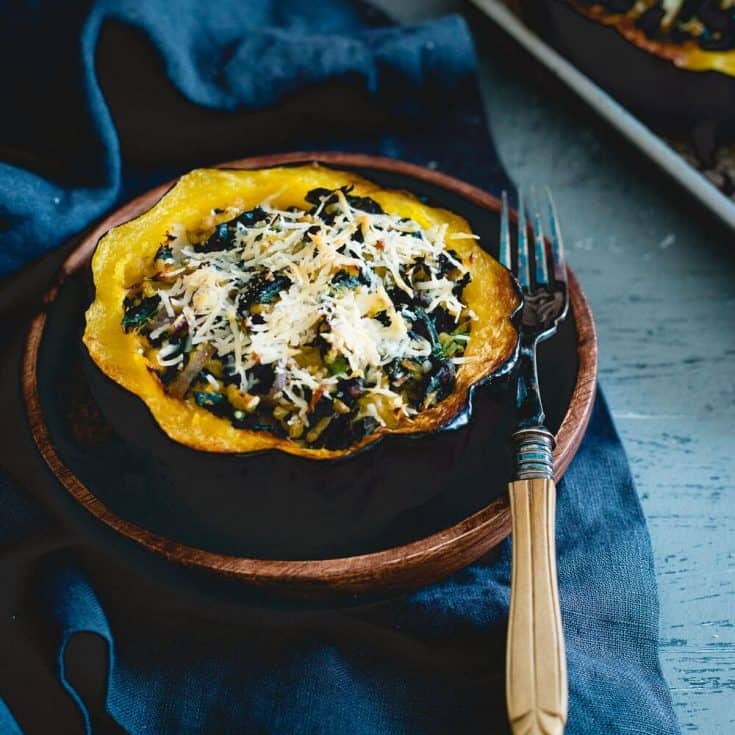 This twice baked acorn squash is stuffed with tuscan kale, hearty freekah and pecorino romano for a lovely fall side with a hidden protein boost. In my parents’ move last month from their house of 26 years to one half the size, I ended up with 2 boxes of everything from pictures to every single school letter, test, diploma, award you can imagine to random ivory utensils from my dad’s family in India. While baby pictures of myself all the way through high school graduation (thanks for those excellent bangs circa 3rd grade, mom) definitely provided some entertainment just as looking back on every single progress report and report card from grades K-12 re-affirmed my legit nerd status (that got me nowhere in life, glad I wasted all those hours studying) as I sorted my way through the boxes, the one actual item that didn’t make its way into a garbage bag was this blue box filled with these real ivory flatware. We know so little about my dad’s side of the family. He’s an only child from a split household (a really long and bizarre story on that) who grew up in India but isn’t of Indian descent at all. He was raised orthodox Jewish (with an Italian catholic mother) but from somewhere in the middle east (Iraq?). He moved to the states at 18 and the amount of family memories/heirlooms that made their way over could probably fit in a small box at most. It’s equal parts sad and intriguing. Needless to say, these ivory utensils that date back at least to his childhood are something I’ll gladly keep (unlike the pictures of my braced, 5th grade, ‘blew up like a tick before growing 6 inches’ self) from the box of memories my mother gave me. 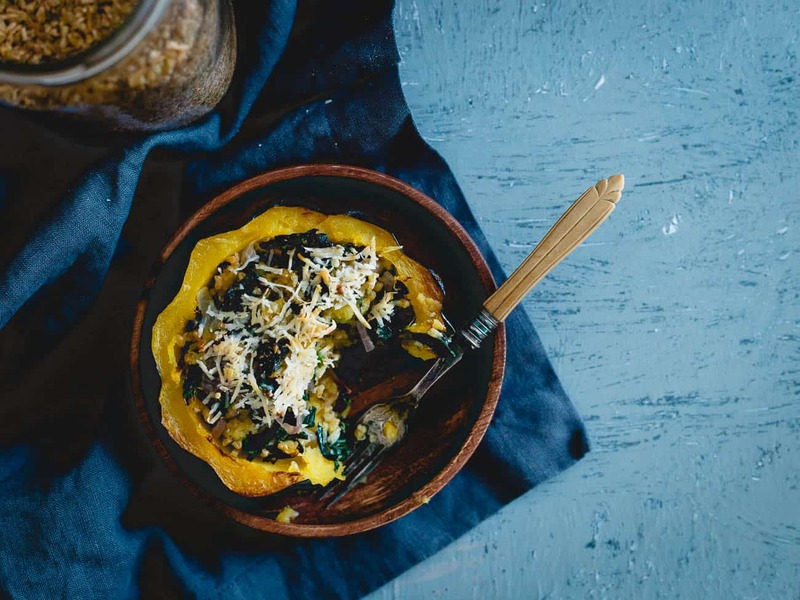 I wouldn’t say the utensils inspired this recipe for twice baked acorn squash as much as created a sense of comfort within making me want to translate that feeling to food. 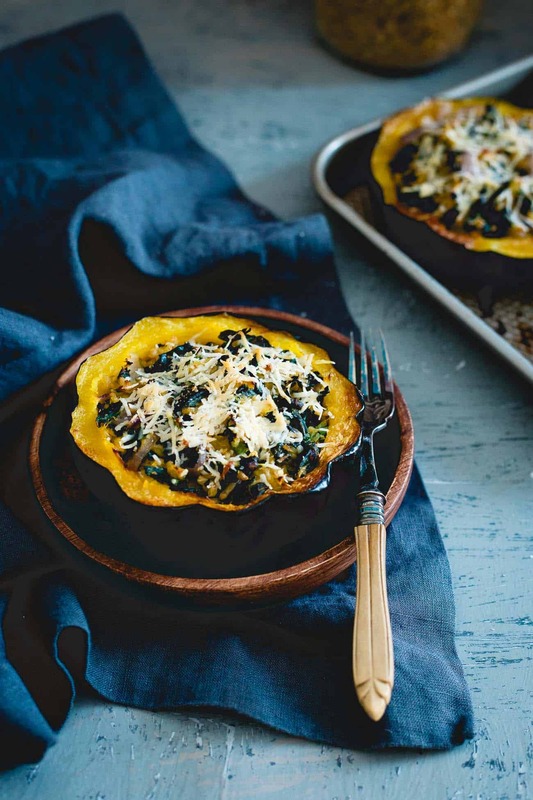 Stuffed with hearty freekah (a lovely grain that doesn’t get as much attention as it deserves), kale, pecorino romano and aromatic rosemary, the comforting, cozy factor definitely comes through in these twice baked acorn squash. 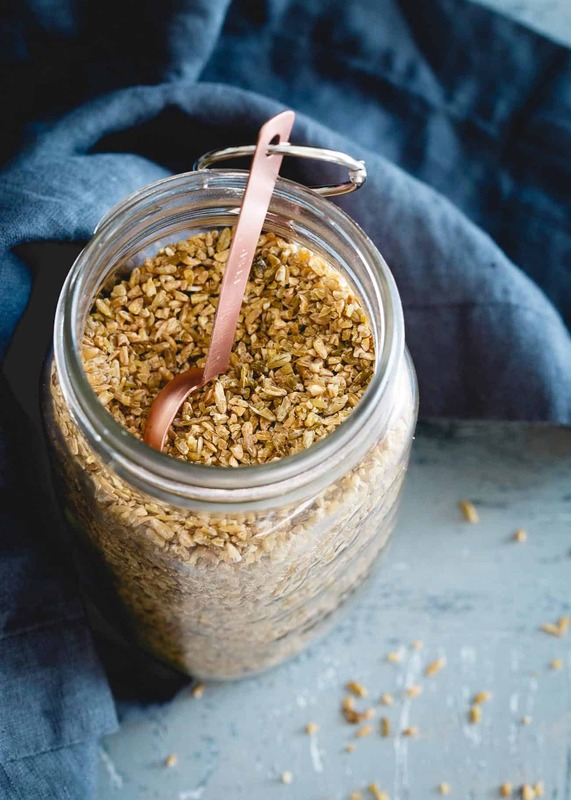 It’s also boosted with health supporting Vital Proteins collagen peptides, a tasteless addition that not only adds extra protein but an array of bone, joint and gut benefits as well. I’ve added it to butternut squash biscuits, nectarine upside down cake, mango melon soup in the past as well as my mug of morning coffee every single day and you’d never know. It detracts nothing from the food while giving you all those added health benefits, a complete a win win. Comfort food is the best kind of food, isn’t it? Cut acorn squash in half to create two bowls out of each. Scoop out the seeds, drizzle with the olive oil and place cut side down on a greased baking sheet. Roast for about 20 minutes until flesh is softened but the squash is still firm enough to hold it's shape well. While squash roasts, combine freekah and broth in a medium sauce pot over high heat. Bring to a boil, stir, reduce to low, cover and cook until all the liquid is absorbed by the freekah. Set aside. Add the onion and rosemary and saute until softened, about 5 minutes. Add the kale and cook another 3-5 minutes until wilted. Season to taste with salt and pepper. 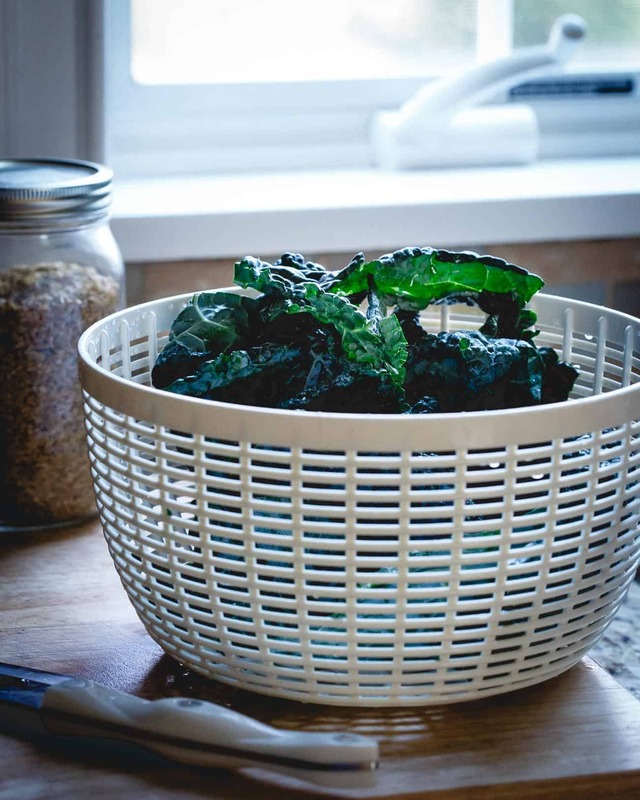 Place the kale mixture in a large bowl with the cooked freekah, collagen peptides and cheese. Gently scoop out some of the flesh of the acorn squash, leaving enough in the squash so that it stands up and holds its shape well and place it in the bowl. Mix the ingredients in the bowl together and scoop them back into each squash half. Top with additional pecorino romano and return to the oven for another 10 minutes to warm through and melt the cheese. Finish under the broiler for about 2 minutes for a golden brown and crispy top. Such a great idea! I love this for Fall! Nothing sounds better for a Thanksgiving side dish, this looks amazing! So lovely. 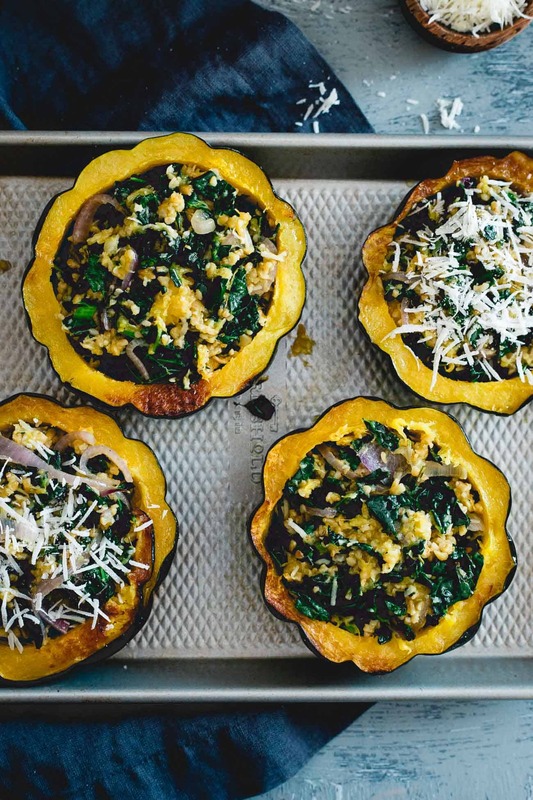 We are on a big acorn squash kick right now. I’d love to try this on my family! I’ll second that Gina! Comfort food is the best kind of food. And these sound so delicious. Perfect as a side or even as a meal. Comfort food for sure is the best kind of food! 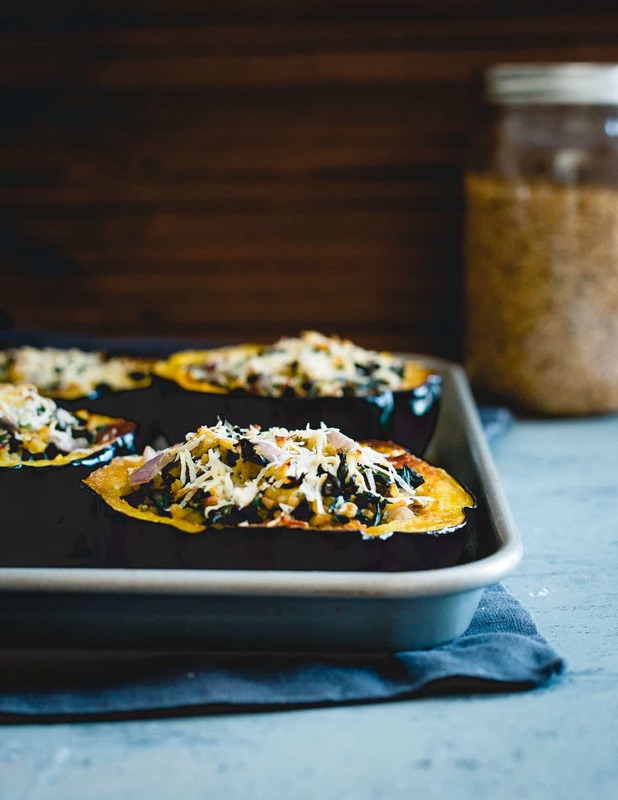 Love me some stuffed squash with sweet and savory flavors! 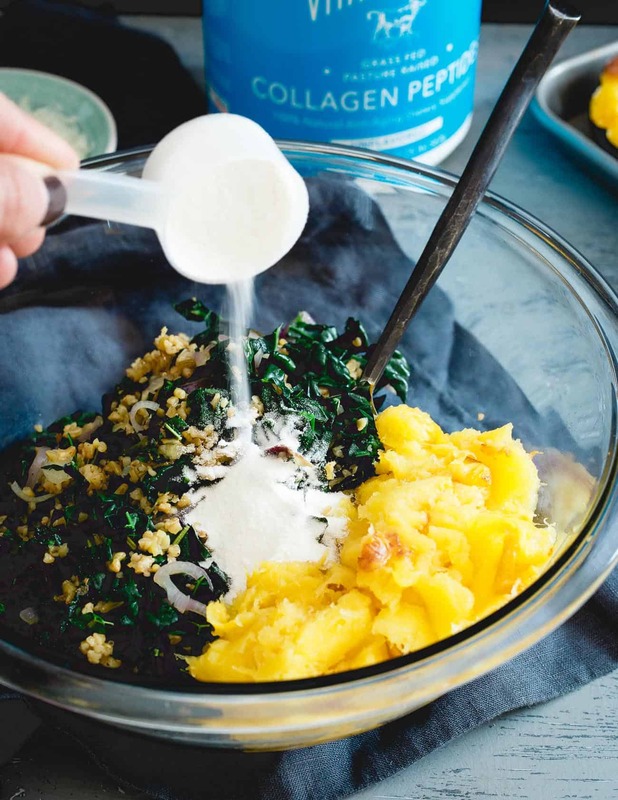 Such a great idea to add collagen for a flavorless protein boost! WOW! This looks amazing. It would be great on our holiday table next week. I need to make this for lunch today! What an interesting background your dad has! 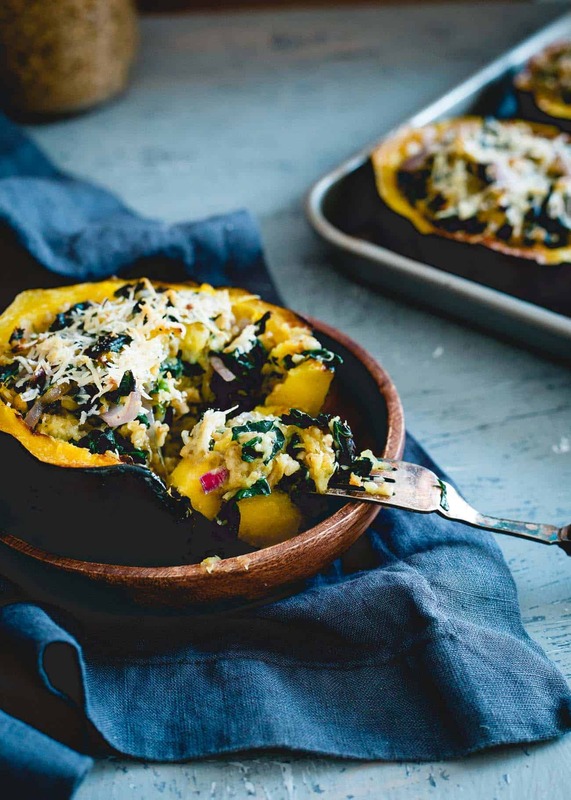 What an awesome idea to slip the Vital Proteins into this squash for an extra boost of nutrition. And I love anything that involves freekah. This looks so perfect! I love stuffing acorn squash!